For several years Jacob Yikes has steadily been solidifying his reputation as more than a street artist or muralist. While his street work remains impressive, distinctive and at times, prodigious, his studio works have increasingly become sophisticated and revealing, exploring both thematic and procedural evolution. Opening on Friday the 9th November at the newly relocated Fiksate Gallery on Gloucester Street, Bad Company is made up of new work created over the last twelve months, as the artist has wrestled with a tumultuous period which saw him stop painting for several months following a raft of personal issues. The resulting output reveals a dense psychological narrative, with Yikes’ precarious architectural spaces and often nightmarish landscapes populated with a raft of symbolic occupiers, pulled from the artists’ memories and experiences, at times subconsciously. The effect is a series of works that are heavily therapeutic for the artist, while still asking the viewer to make sense of the mysterious scenes through their own experiences or constructed narratives. 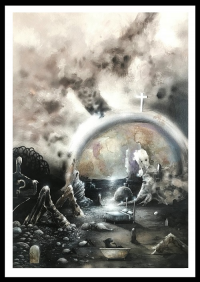 The show’s title, Bad Company, suggests this duality, not only referring to the artist’s internal conflicts, but also the potential confrontations facing the viewer within the ominous terrains and settings. While the works in Bad Company vary in size, the size of the larger works is impressive and revealing. The increased scale affords Yikes’ various painterly and mark-making techniques to become more obvious, with a gestural quality adding an emotive dynamism to the works, a sensation that can be explored while the viewer is drawn into the scenes, rather than kept outside looking in. The gestural mark-making also reveals Yikes’ expressive physical movements in a way not as evident in the much smaller, finely-worked details that are still evident, but now part of a larger tapestry of effects. The show also affords Yikes the opportunity to investigate the atmospheric potential of lighting and music upon his work, a long-held interest enabled by the specialised setting of urban contemporary gallery Fiksate. Bad Company promises to be a further evolution of Jacob Yikes’ studio work and is sure to prove a must-see. Bad Company is the first show hosted by Fiksate since moving from their old home in New Brighton to their new location at 165 Gloucester Street and runs until December 7th, For opening hours, see @Fiksate on Facebook or visit www.fiksate.com. Original generation time 1.5715 seconds.